Vending machine displays 10 selections of bulk candy. Dimensions: 2.2m x 1.6m x 0.7m. 10 hoppers holding 3kg of candy each. Delivery of approx 200g per cup. Software control via code initiation post 500 vends. Sweets supplied by Blue Monkey Vending delivered to operator with new code. Food registered, CE marked and country specific compliant. Give us the Space... We'll make you money! Mixes the sweets into the cup for the customer. Limits wastage and theft – stock loss. Easy maintenance – reduced time spent controlling these concerns. 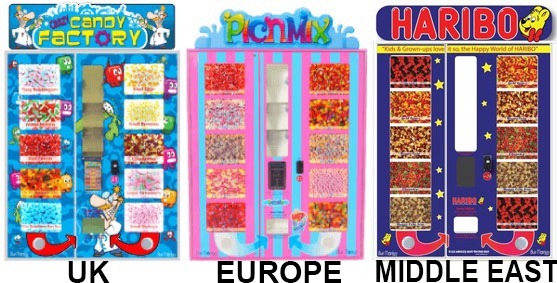 The machine occupies less space than regular Pic n Mix units and offers a higher turnover per sq. foot. Interested in Buying or Renting our Machine? Blue Monkey Vending, operates worldwide and is very proud of our expert team who are here to help you and offer support 24/7. Our products are designed in-house which enables us to offer you a bespoke machine, catering for your individual requirements. We can also provide you with products that cater for all dietary requirements. If you’re looking to add a WOW factor and fully embrace the future of Pic n Mix sweet vending along with venue enhancement, look no further than Blue Monkey Vending. Let us transport you from the past to the future of digital dispensing. We guarantee you’ll be more than happy with the results. For more information on our sweet vending machines, please do not hesitate to get in touch. Blue Monkey Vending's team will be more than pleased to help you and offer our support! © 2010-2019 www.bluemonkeyvending.com All Rights Reserved. If you would like to get in touch to discuss our products and services, please fill in the form and a member of our team will be in touch, at a time convenient for you.